Never had to do this before, but reading a .docx on an iPhone 4 is completely painless. Very good indeed. I love his description how you code first, then estimate, then deliver. While working on the next sprint. Haha, der Artikel ist gut. Aber offenbar hat der arme Mann tatsächlich zu viele Kollegen vom Typ "small minds, poor writing skills" erlebt. Denn ich würde aus meiner Erfahren genau das Gegenteil behaupten. Es liegt wie so oft an den Aufgaben und am Personal. BTW: unfortunately reading an OpenDocument on an iPhone 4 is not completely painless. Neither the built-in viewers nor for example GoodReader can open it. If somebody sends me an OpenDocument format, I have to ask them to convert it to something I can read. Happens only with IBM so far. The problem of Agile, Scrum & co is not so much it's own logic (even if there is ground for debate), but the twisted path to implementation. Has anyone read about or witnessed a change process which used Scrum or agile methods to introduce Scrum and Agile methods? I haven't so far. It defeats logic: We know, that centralised, top-down, pre-specified projects are screwed up and fail most of the time. Therefore we want to introduce radically different methods. But because we need to learn them and we have processes for that, we first define those change process programs "old school", agree on budgets and a project plan. Then we invite suppliers, which of course a old school specialists. Who else would be able to comply to those old school tender processes? And of course that way a Scrum master is just another project manager with a fancy title. I also came across a few Scrum gurus, who simply were disciples of a Scrum religion. These type of people go by the letter, for them it is simply a question of scriptures. We replace the old system of how you were being told what to do, by a new system of what to do - Scrum is thy name. Follow the Scrum guide from a to z and you will see the light. 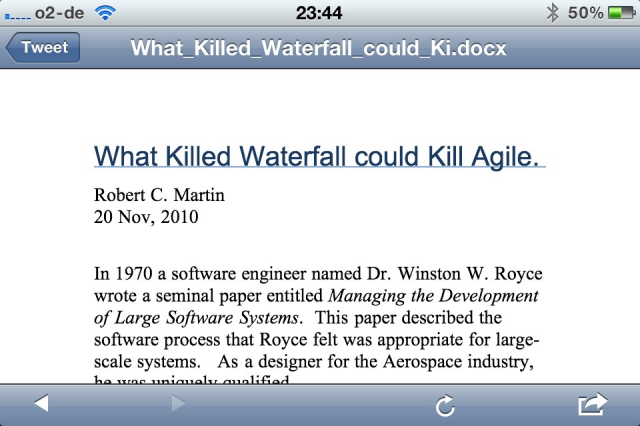 Well, folks, Agile means there is no "a to z", no 1-2-3. Agile means embracing uncertainty.